Two high school English teachers celebrate their 13th year of teaching. 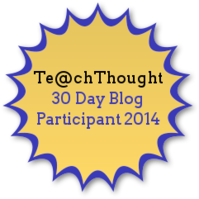 We have decided to participate in Reflective Teaching: A 30 Day Blogging Challenge for Teachers. This challenge was created by Te@chThought, and the daily prompts can be found here: Reflective Teaching questions. We encourage any teachers to join us in this challenge. Your responses do not have to be lengthy; a paragraph or two would suffice. Here is our Day 3 prompt: Discuss one ‘observation’ area that you would like to improve on for your teacher evaluation. I know it’s the honeymoon period – but I had two spectacular days with my students. It is a challenge getting thirty-five 9th graders to focus for an entire class period (in a WARM classroom after a long summer break) but I think that I rocked it today! We are reading from Tim O’Brien’s The Things They Carried tomorrow, my students will receive their first writing assignment (an essay about what they carried with them on the first day of school), and they will be introduced to digital storytelling. *Side note that has nothing to do with today’s prompt. I created a digital story to use as a teaching tool in my classroom using O’Brien’s novel as a mentor text. I will be sharing it tomorrow. It is the first time that they will “hear” my writing and it allows me to expose a vulnerable piece of my heart. Over the past few years I have had success with this digital story in creating a trusting classroom community and modeling myself as a writer. To view the digital story click HERE. Needless to say, it has been a busy first two days of school and I am exhausted and feel hopeful for a stellar year. Now to address today’s prompt and what area of my evaluation I would like to improve on. I would say that every year I struggle with grading and updating my on-line grade program. With 130-150 students each year it is easy to get bogged down by this daunting task. On weekends I always have the best of intentions to grade… Yet, I get pulled into my second job, meal prep, and rest and rejuvenation. What I am predicting is a future blog post that highlights what works and what does not work with portfolios in Mrs. Laitinen’s room. It is time for something new and while I plan to still give students feedback on their work, I am hoping that a detailed collection of each student’s work (and various drafts) will help all of us (teacher, students, parents, my principal) see growth in my student’s work. Please wish me luck! I find it a challenge to engage all students in learning every day. I think I do a good job of engaging most students, but there are often one or two who are off task despite my redirection efforts. Sometimes I feel like I would need to be Bill Cosby to get every student’s attention. With 132 students a day, it is a miracle to get them all to want to participate in reading activities, class discussions, and writing prompts. When I taught a middle school Science Exploratory elective and students were doing hands-on activities such as building rockets and racing solar cars, I found it easier to engage every student. Even in that class, though, when I asked students to take out their interactive notebooks or to discuss an article from Science World, I would get some groans. On my Professional Staff Evaluation last year, I received a 2.5/3 on engagement. 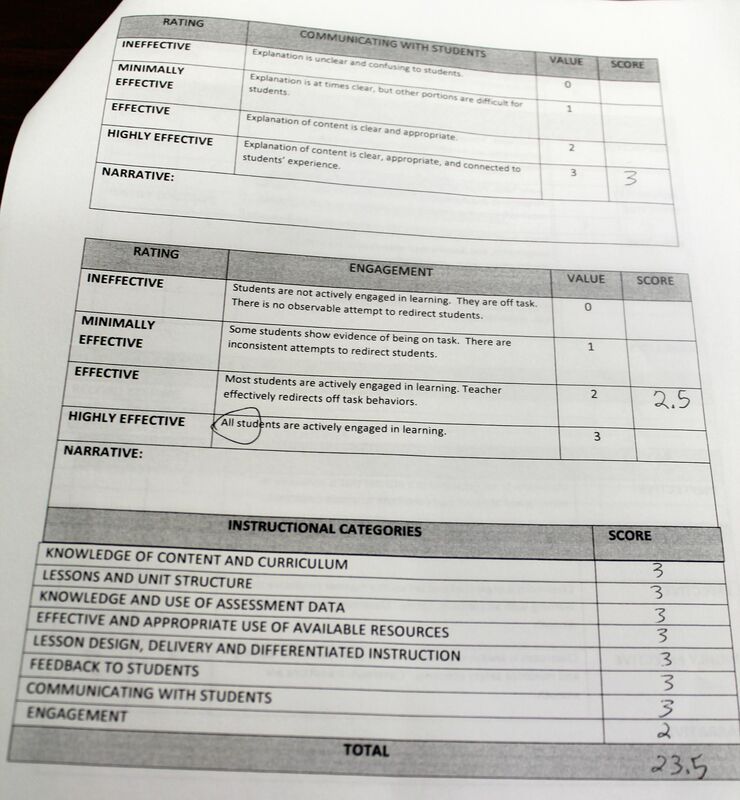 The principal circled the word “all” in the phrase “all students are actively engaged” to show why I did not receive the ‘highly effective’ rating in this category. When she observed my teaching of sixth graders during a writing lesson, I had one particular student who would not respond to the prompt. Throughout the school year, I struggled to keep this student with special needs on task. I tried to seat her away from distractions; however, I often found myself standing near her desk to focus her attention on the lesson, and I often would find myself taking away markers or colored pencils so that she would participate in our lessons. I think it is fine for students to doodle — I do that myself — but not when they are supposed to be doing a quick write, for example. On this particular day, even though the principal was sitting next to her and even though I was trying to help her brainstorm ideas, this girl would not pick up her pencil to write. This year, I teach juniors and seniors. Today was day two of school, and I already have some struggles keeping every student engaged. I must say that the seniors all tuned in when I announced that I had an idea for grading: every student in class would receive the same grade based on the overall class effort. I had them do a quick write on whether they thought that would be a good idea. One student, who said she works hard for her As and has no intention of sharing that grade with others who do not try as hard, almost had smoke rolling out of her ears while she wrote ferociously about all the drawbacks. Another student, who said he would benefit from the higher grades of his classmates, commented that he was writing his prompt as though it were a letter to the President; that’s how strongly he felt in favor of the idea. Of course, I just brought this up as a hypothetical situation. It was an introduction to Kurt Vonnegut’s “Harrison Bergeron,” set in 2081 in a dystopian society where everyone is forced to be equal. One senior, who was my student in 10th grade and the last part of 11th grade, followed along while we read the short story. When it came time to work with a partner to discuss the story, however, he put his head down on his desk. When the bell rang, he left his assignment sheet on his desk, and it hadn’t been started. I’ve tried to redirect this student many times, but to no avail. I left a message for his parents after class today, saying that I hope they encourage him to participate and that I enjoy hearing his perspective during class discussions. He really does bring an interesting perspective, and when he chooses to talk, the whole class listens. I believe that a have developed a good rapport with both this sixth grader from last year and this 12th grader from this year, but if there is a way to keep them engaged on a daily basis, I don’t know it. One thing I do often is adapt the lesson if it seems like students are not engaged. Today, for example, I had my juniors take turns reading aloud “The Story of the Times: Beginnings to 1750s.” This is a 6-page introduction to the beginnings of American Literature, from the Native American oral traditions to the moralistic writings of the Puritans to the writings of Southern aristocrats who, unlike the Puritans, did not object to fiction and drama. I like to have students read aloud; however, it can be frustrating for everyone when they are struggling readers and the vocabulary is beyond their level. It took longer for them to read this selection than I expected. We stopped several times to discuss what we were learning and to break up the reading, but we needed more activity. Everyone participated; however, after class, I made a note to myself to change the way we do this next year. I think it would work better to break the reading into sections and to have student groups become ‘experts’ on their section and then present what they learn to the class. Not only do I change the way I teach a lesson from year to year, I often find myself changing it from hour to hour, depending on the makeup of each particular class. I don’t know if it is possible to keep every student actively engaged in every lesson. It would take a teacher with exceptional skill to achieve this and I am not there yet. Teaching in a district categorized as ‘highest poverty,’ I’ve learned that some students come to class with more pressing matters than what they are going to learn in English class that day. I’ve had students tell me that they spent last night sleeping in a car or that their dad overdosed on drugs yesterday or that their family has no food in the cupboard. Like other teachers in my school and around the country, I know that my job is critical, not only for my students’ education but for their overall well being. I had a professor in an education class, Dr. John Covaleskie, who encouraged pre-teachers many times to “teach where you are needed.” I believe I am needed where I teach, and that is what keeps me going. I join other teachers in a quest to find ways to connect with students, to show them the value in what they are learning, and to ignite a spark of interest that will lead them to become active learners not only in school but throughout life. We are compiling our daily responses to the prompts on a separate page. Click HERE to read our other posts. If you would like to continue with our 30 day blogging challenge, please follow this blog (on the right side of the page) and/or follow our new Facebook page: Blended Voices – Two Teachers Blog. We look forward to sharing this journey with you. This entry was posted in Teaching and tagged 30 day reflective teaching challenge, engaging all students, english teachers, english teachers blog, Northern Shores Writing Project, Teach Thought. Bookmark the permalink. Heather and Amy, I had to chuckle as I read your goals: grading and engagement. Both goals are signs of a good teacher trying to get better. Make our day! Follow our blog!